With the advent of the new year, many of us are already looking forward to the start of the new camping season. For some, that will begin in February, for many others, Easter marks the start of the main camping period. Even those of us who don’t venture out until late March / April are going to notice a distinct chill to the Spring evenings, and considerably more so, at night. There are many heating options available, on the market today, but what are the pros and cons, and which ones are the safest to use? The first, and most obvious distinction is gas versus electric. The simple answer with gas is; DON’T (at least not in the long term). Some units will come with their own, inbuilt heater, many of which will operate on both gas and electric. These units are externally vented, and are the only ones that are reasonably safe to use for any period of time. If you don’t have a fitted heater in your camper, then other forms of gas heater are best avoided, as the risk of fumes and the potential fire hazard render them unsafe for prolonged usage. That said, even if you do have your own onboard heater, whilst this is fine, where there is no EHU, why pay for your own gas, when you are already paying (in most cases) a flat rate for your electric hookup. For the purposes of this review, we will look at the ultra portable gas heaters, that utilise the mini gas canisters, as in the picture above, although the principles will apply to any such portable gas appliance. The issue here is that these heaters are not designed to operate indoors, in spite of many misconceptions to the contrary. They should only be used in an extremely well ventilated area, and, in extreme cases, if faulty, can emit harmful, and, potentially, lethal doses of carbon monoxide. Having said that, it is only fair to put this into perspective. These heaters are no more or less dangerous than the gas hob and grill found in most folding campers on the market today. This means that they can be used for short periods of time, but are not recommended for prolonged usage. The same is true of the gas hob. Many people believe that these can be used to heat the camper, in the absence of an alternative form of heating. Once again, this is true for a short period of time, but is not a safe option as a primary form of heating, due to the lack of external venting. So, gas is best avoided, if you are looking for a safe, long term heating source, in which case, it is likely to be preferable to seek out a site with mains hook up, when camping outside the Summer season. The fan heater is one of the oldest and most established forms of heating (compared to the other three main options) and has been around for years. It remains a very popular method of heating, as it is compact and powerful, and is, possibly, the fastest available method of heating any given space. Because fan heaters are, generally, very compact, and take up little space when packed. Another benefit, unique to this form of heating, is that they can also be used to blow cold air, meaning that they can be a welcome addition to the appliance list across the whole camping season. 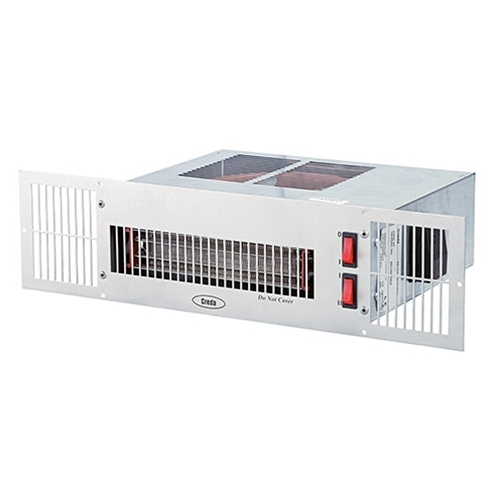 Fan Heaters Are Small, Yet Powerful, Although Noise Can Be An Issue. The downside with this form of heating is that the noise of the fan can be a little intrusive in an enclosed space, and the heating element, although well protected, can be vulnerable, if anything combustible is drawn into the heater accidentally. Also, if left on for prolonged periods, they have been known to overheat, which will often cause them to burn out, and cease to work. This means that they are best suited to heating larger spaces, such as awnings, where the fan is able to distribute the heat more quickly than other forms of heating. In smaller spaces, however, the fan heater can be a little uneven in it’s heating pattern, as it emits a hot blast of air, heating the space quickly. The thermostat then causes the heater to cut out, it cools quickly, kicks back in, another blast of hot air, and repeat the process. In confined spaces, it can lead to a slightly more inconsistent temperature than other heating methods. Some users have also complained of dry throats, etc, when using them constantly over night. Powerful And Easy To Regulate, But Convector Heaters Are Bulkier Than Other Heaters. 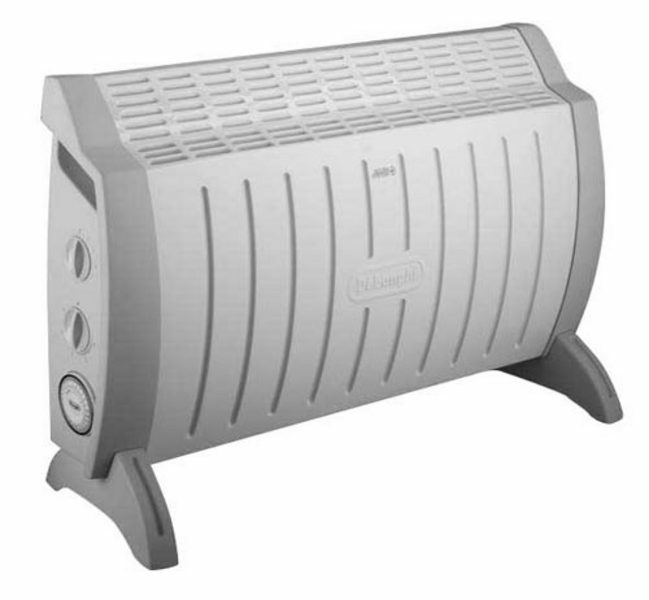 The simplest way to describe this form of heater is that it is, effectively, a fan heater, without the fan. The vents in this heater point upwards, rather than horizontally, as in a fan heater. This is because the hot air from the heating elements rises out of the vents, at the top, drawing in cold air, from the bottom, to be heated inside, and so the process repeats. This is the process of convection, from which the heater gets it’s name. 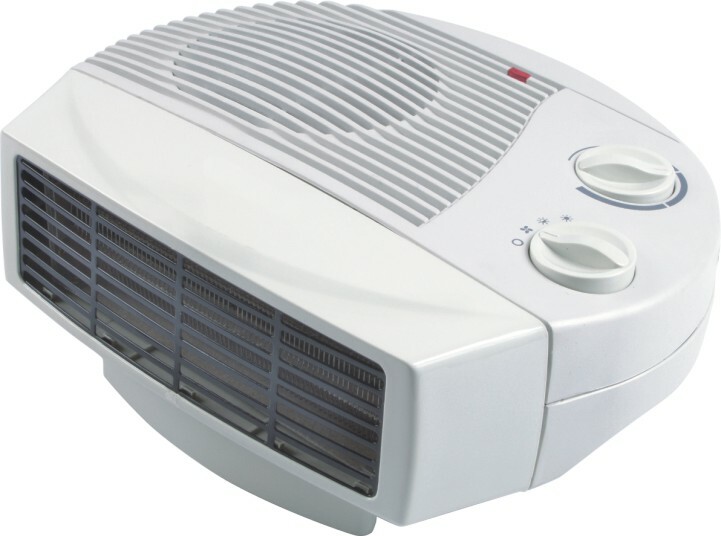 Because there is no fan in this heater, it does not heat a space as rapidly as as a traditional fan heater, but it does allow for a more consistent temperature, in smaller spaces, and, because it creates air movement, it is still fairly effective in heating larger spaces, such as awnings. Like the fan heater, it will, also, often have a thermostatic controller. Halogen heaters use light as the delivery method to provide the heat. Unlike most heaters, they don’t just heat the air around them, they heat everything the rays of light land on. The warming light rays add a kind of soothing nature to the environment, unlike other forms of heating. Halogen heaters, in the main, are very compact, and lightweight, and look much like the old electric fires they have, effectively, replaced. They are normally switchable between one or two heating elements, rather than being controlled just by a thermostat. Most incorporate an automatic cut off switch, in case they fall over unexpectedly. Oil Filled Radiators Are Safe, Consistent And Controllable, But Not As Powerful, Or Quick To Heat, As Other Heaters. An oil filled radiator is the closest we can get to our home heating. It is safe, consistent, and controllable. Unfortunately, a folding camper isn’t a warm, insulated, double glazed home, and, sometimes, we may need just a little more, if the weather outside is not at its best. A radiator provides a steady heat source that is plenty for most campers and small caravans, however, it will struggle to heat a large awning, and, even if it does, it will take a lot longer to get up to temperature than most alternative heaters. Where the oil filled radiator really gains is in the evening / at night. There is no exposed heating element, they can be thermostatically controlled and are the safest of all heating methods to be left on overnight. (In fact, from a personal perspective, they are the only ones I would feel totally comfortable in leaving on over night). So. There is no ideal heater that covers all requirements. The oil filled radiator is the safest, but lacks the power to heat larger spaces, and is slower to heat up. At the other end of the spectrum is the fan heater, which is much quicker to warm up and is capable of heating large areas quickly, however, the temperature is less consistent in smaller spaces, noise can be intrusive, in some models, and they are not safe to leave on overnight. Ideally, we are likely to be looking at taking two heaters with us, if we are going away during the colder months. One of those, should, most definitely, be an oil filled radiator, for safe, consistent, overnight heating. The second is entirely personal choice, but halogen heaters and fan heaters are, in the main, a lot smaller than convector heaters, so easier to stow. All depends on whether you prefer the slightly noisier power of the fan heater, or the more subtle warming glow of the halogen heater. If you have an awning to heat, as well, then, probably, the fan heater will be the better option. There’s nothing to stop you using both, at the same time, as long as you are mindful of the power ratings of both the heaters, and the electric hookup. OK. So; what heaters can we actually use on electric hookup, and how many can we use together etc? Obviously, the answer to that will depend on the power rating of the appliances. Most heaters, regardless of type, will range from 500W for a small oil filled radiator to 3KW for a high power fan heater. Obviously, we can use six 500W heaters for the same power usage as one 3KW one. Most sites are either rated at 10 Amps or 13 Amps. Watts = Amps x Volts, so a 10A site, with a 230V supply will support 2,300W of power (10A x 230V). Likewise, a 13A site will support 2,990W of power. A decent 1,500W heater should keep the camper reasonably warm, whilst still allowing you to boil a kettle (600W) without having to turn the heater off on a 10A site. It will, also allow you to run the heater with an additional 500W radiator to back it up. The radiator can then be used, on it’s own, as an overnight heat source. Obviously, on a 13A site, the ratings increase proportionately, but, if you work on the 10A specs, you will be covered for all sites. Most appliances will have their power rating on a label somewhere on the unit. If not, it will be in the manual, or advertising literature. Worst case, you can, usually, get a reasonable idea by searching online. Whilst on the subject of overnight heating, it is probably worth mentioning another alternative; the electric blanket. These are a safe, and increasingly popular, alternative to the oil filled radiator to keep you toasty at night The only downside to these is that they don’t heat the surrounding environment, so getting up for that early morning cuppa can still be a little chilly. There have been questions raised over the suitability of electric blankets when used in conjunction with memory foam mattresses. These are, in fact, perfectly safe to be used together. In some ways they are, in fact, actually better, because of the way they work. The concerns around the memory foam ones stem from the fact that that they are temperature sensitive, and adjust in line with the temperature around them. This means that they are firmer in cold temperatures, and softer in warm temperatures. The fact that they absorb warmth is a bit of a bonus, as it keeps you warm underneath, as well, though it is recommended that you place a normal blanket between the electric one and the mattress, and that you start with lower settings and work up until you get the balance right. In this post, we have tended to look at the alternative types of portable heating that you can take with you to heat your camper, or other unit. There is, of course, one other option you may wish to consider, and that is the installation of a plinth heater. These are designed to work in kitchens and bathrooms, and are, effectively, a fan heater, built into the units. They are increasingly common equipment in new folding campers these days, and are a very effective way of heating the main camper cabin. At between £50 and £100, on average, they are a cost effective, and relatively simple installation. They have all the advantages of a traditional fan heater, but with reduced noise levels, and no heater or wires to trip over in a confined space. Be aware, though, that they are designed for use in kitchens and bathrooms, where heating tends not to be a 24/7 affair. However great they may be for daytime / evening use, the oil filled radiator still stands out as the safest over night option. Whatever method of heating you use, it will significantly extend and enhance your camping season, whether that means an extra Winter break, or just making the camper a little more comfortable for the Easter break, which, for many, represents the start of the main camping season. 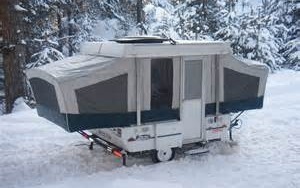 This entry was posted in News And Information and tagged Camping, Cold, Folding camper, Heater, Winter. Bookmark the permalink. Excellent piece, and an excellent site. Thanks. I’m just about to buy a secondhand 2006 Pennine Pullman and have been researching it online extensively for quite some time, but particularly in the last few weeks as I’m now finally actively looking to buy with the finances lined up. I don’t think there’s a site I haven’t visited on folding campers or clip I haven’t seen on youtube on primarily UK campers of all sorts and makes. Your site was invaluable to me, as were the clips you had on youtube along with the emphasis on Pennine, and especially articles of this standard on heating the camper and numerous other articles on this site. They really answered every possible question I could have in such a pragmatic and logical way. You have a fan in me. Thanks Niall. Glad you’ve found it to be of some use. At least you’ve done the right thing by researching it all, properly, first.